Ever since becoming professional partners in 1997, Anton and Erin have become one of the most well respected and highly sought after ballroom couples in the world. After winning numerous national and international competitions, they joined BBC’s new show Strictly Come Dancing in 2004 where they quickly became household names. Anton has gone on to appear in all fifteen series of the show and Erin participated in ten series before taking a step back from the competition prior to the birth of her son. 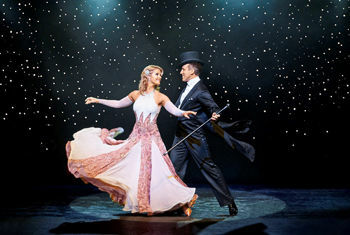 In this wonderful celebration of the golden age of Hollywood the dancing couple will be joined by their Strictly Come Dancing co-star, Lance Ellington who is known for his silky smooth voice and dynamic live performances. Anton and Erin will also be joined by the 25-piece Manchester Concert Orchestra conducted by Richard Balcombe. The show will feature such classic music as Somewhere in Time, Cry Me a River, Mr Bojangles, Downtown, This Nearly Was Mine, New York, New York, Couple of Swells, Libertango and many more. Accompanied on stage by six world class Ensemble Dancers, Anton and Erin will be sure to dazzle across the UK.